— John Law, After Method. If you start reading discard studies, you’ll come across the adage “one man’s trash is another man’s treasure” in short order. This is more than a cliché: there is something about discards that is inherently contested, multiple and fragmented. Thus, discard scholars need methodologies that don’t tidy up the mess and make trash one kind of stable, universal thing, described and solved forever. 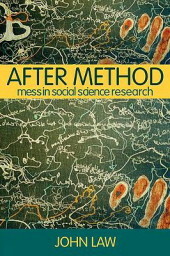 Cover of After Method: Mess in Social Science Research by John Law, 2004. “The task is to imagine methods when they no longer seek the definite, the repeatable, the more or less stable. When [we] no longer assume that this is what [we] are after” (6). Realities are created by methods. This has been a common argument in Science and Technology Studies since Bruno Latour and Steve Woolgar’s Laboratory Life. This is not to say that scientific or scholarly studies are willy nilly and relative, but that different practices (methods) produce different kinds of things. Plastic is an example of a multiple object that nonetheless hangs together. The Plastic Pollution Coalition states that plastic never completely degrades: “plastic is forever.” For all intents and purposes, for an organization dedicated to eradicating disposable plastics, this statement is entirely correct. A recent scientific article on microplastics by Anthony L. Andrady details the exact weight loss of certain plastics due to miniscule amounts of biodegradation (“0.2% to 5.7% carbon conversion per 10 years for low-density polyethylene [LDPE],” for example). This is also correct, and can help scientists determine ideal laboratory conditions for biodegradation. Tom Fischer, a Professor at the School of Art and Design at Nottingham Trent University, has interviewed consumers about how their plastic goods “die,” or become brittle, discoloured, ugly and stained, which leads to its eventual discard. In this case, plastic clearly degrades. These three realities of plastic degrading are each true based on slightly differing definitions of “degrade.” In each situation, plastic is a different kind of thing with a different relationship to the environment, consumption, and dispossession. In the words of Paul N. Edwards, the object “shimmers” because there are several distinct but overlapping versions of the same thing. John Law, following Mol, Latour and Woolgar, writes that, “[w]e are not dealing with different and possibly flawed perspectives on the same object. Rather we are dealing with different objects produced in different method assemblages” (55). Treating objects of study as multiple and shimmering leads to a way of thinking where objects have complex presents where identities are situational, ephemeral and even fragile. How do we, as scholars, deal with this multiplicity and contingency? How do we make sure we capture, but to not finalize, this multiplicity and do justice to our topic in a way that makes sense and moves our research forward? These are crucial questions for discard scholars, and, I would argue, all researchers. I’ll review only two of the various ways John Law suggests thinking about these questions : method assemblages and ontological politics. Law, and many others, argues that interactions with the world create reality by focusing on some parts and ignoring others, by dividing signal from noise. As part of this process, some things, and particularly methodologies that guide people in distinguishing between signal and noise, disappear and become naturalized or taken for granted as background assumptions. Law calls this bundling a method assemblage. He asks that researchers are reflexive about how we craft these bundles of relations, how we generate presence and absence. When this act is self-conscious and attendant to the situation an object of study exists in he likens it to “gathering” because it becomes a method that does not judge what is right or wrong, good or bad, but symmetrically gathers together bits that are coherent, incoherent or non-coherent. Gathering is a method that does not prejudge inclusion in a study based on whether things make perfect, complete sense or fit together to create a stable object. It considers some kinds of noise significant. It acknowledges the process of distinguishing noise from pattern, and, more importantly, considers how that pattern is detected and maintained as a meaningful set of relations. The strength of this method is that it “makes manifest what is otherwise invisible. It extends the fields of visibility, and crafts new realities…. And at least sometimes, it also does something that is even more artful. This is because it makes space for ambivalence and ambiguity” (90). “If realities are enacted, then reality is not in principle fixed or singular, and truth is no longer the only ground for accepting or rejecting a representation. The implication is that there are various possible reasons, including the political, for enacting one kind of reality rather than another, and that these grounds can in some measure be debated. This is ontological politics” (162). In other words, our research makes bundles of relations that in turn create a sort of reality. Plastic is permanent. Or permanent-ish. Or is technically not permanent at all. Each statement is based on sound data, and each carries a different set of politics for how relations between plastic and permanence are bundled. They may all be true, but Law argues that truth is not the only “good” by which to judge successful research. Politics, and specifically politics by framing an object of study as one or another kind of thing— that is, ontologically—is another good to judge research by. “If politics is about better social (and now, we learn) non-social arrangements, and about the struggles to achieve these, then method assemblage and its products can also be judged politically. It does politics, and it is not innocent” (149). Of course, this is not to say that researchers should skew research away from truth for political ends, but that every study is inherently political because of what it makes present and absent through its differentiation between signal from noise. Ontological politics is merely the name for judging our works on this basis. I think many of us who study discards are politically motivated. That is, we want better social arrangements whether we focus on sanitation workers, scavengers, environmental harm, policy, or the psychology of waste or hoarding. After Method provides a space to think about how those politics are always already inherent in any methodology, how to self-consciously think about those politics as part of how we create our object(s) of study. Most importantly, it paves the way for methods that are most appropriate, illuminating and even just for our object(s) of study. This entry was posted in Methods, Waste and tagged After Method, John Law, methodology, multiplicity. Bookmark the permalink.